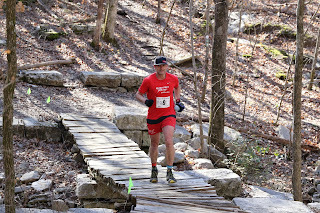 Once a year, Huntsville hosts not only the state's oldest and largest, but in my opinion also the most technically challenging ultra marathon in the Southeast. 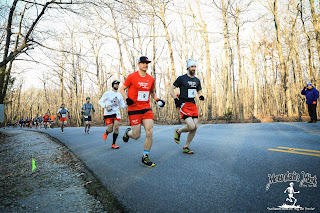 Yes, Mount Cheaha 50K has more elevation gain and yes, Stump Jump and Georgia Jewel have a "rock garden", but mile for mile, the Mist has them beat when it comes to gnarly technical terrain for almost the entire 31 miles except maybe the first 3 miles. Am I biased, hell yeah! This race is literally in my backyard and by that I mean it is less than a mile behind my house (as the crow flies) and I have run it a total of 7 times with my streak only broken for one year in 2013, when I had to take a year off due to a bit of an injury and a health scare. Alas, i have to run 3 more times to earn that coveted black jacket for finishing 10 editions of the Mountain Mist. It's our local version of the PGA's green jacket and I dare say it means more to most local ultra runners than that as well. 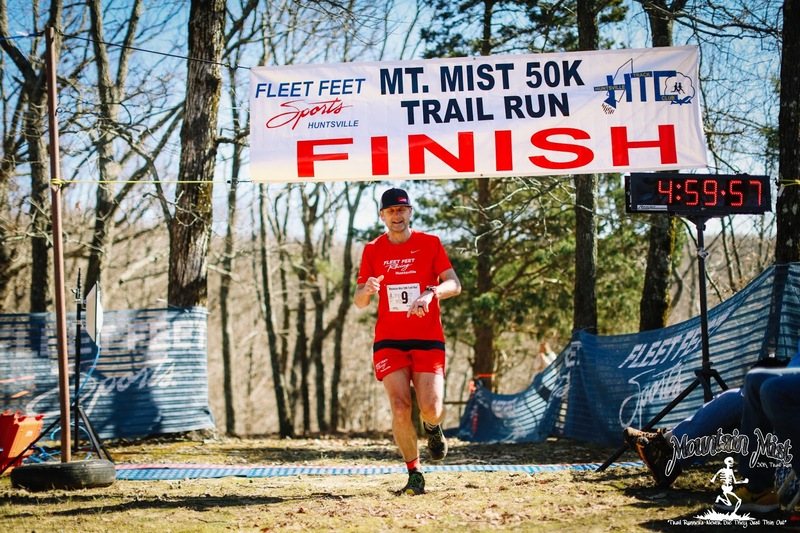 That is to say, Mountain Mist is more than just another ultra. This race has more multi time finishers than any other race I've ever participated in. Folks keep coming back from near and far, year after year, to reconnect with friends and to toe the starting line and cross the finish line one more time, again and again. Mountain Mist is special. Normally, I set my alarm as late as possible the morning of a race, just so I can squeeze every last minute of sleep out of the night. Usually, I will have been up all night paying the price for hydrating just a little too much the day before, so every minute of sleep counts. But on the morning of the Mist, my wife and I take separate cars, so I can head to the lodge early to catch up with friends, both local and from out of town. Yet, even when I arrived an hour before race start, I still did not manage to catch up with everyone I tried to say hello to. However, at the Mist, you get yet another chance to catch up with everyone you may have missed at the start. 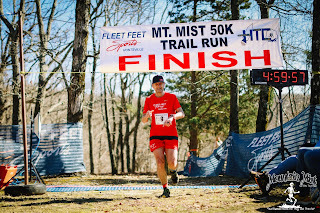 The finish line of the Mountain Mist is second to none. 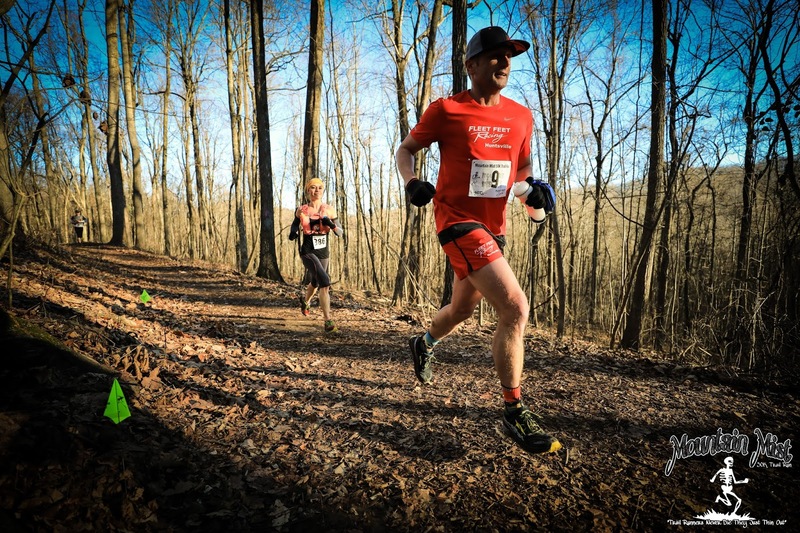 No other ultra marathon I have been to has a vibe that compares to this one. Yes, we usually end up with decent weather at the finish, but it is way more than that. People hang out long after they finish, to grab a bite of the amazing food, set up and served by local "crew god" Tony Scott and an awesome team of volunteers. Even better, there are always lots of brews stashed away some place, so no one goes thirsty...unless they prefer to, of course. And they want to see their friends finish. For at least 4 hours, from the first finisher (his name is usually David Ridde, if he is in attendance) to the last finisher, fellow runners, volunteers, families and friends cheer on their fellow runners and adventure seekers. If it's too cold, runners file into the lodge to warm up by one of the two huge fire places. If its warm and sunny as was the case again this year, then most folks just chill out behind the lodge at the finish line. It is an amazing atmosphere and my favorite race by far. As usual, I lined up in the second row from the front, far enough back not to get sucked up in the sub 7 minute crowd, yet close enough to the front to run with some of my Fleet Feet Racing teammates, who all generally did a better job at pacing than me. This allowed my to chitchat and make sure I didn't go out too fast or too slow. The plan was to back off sooner rather than later, if anyone started to push the pace. 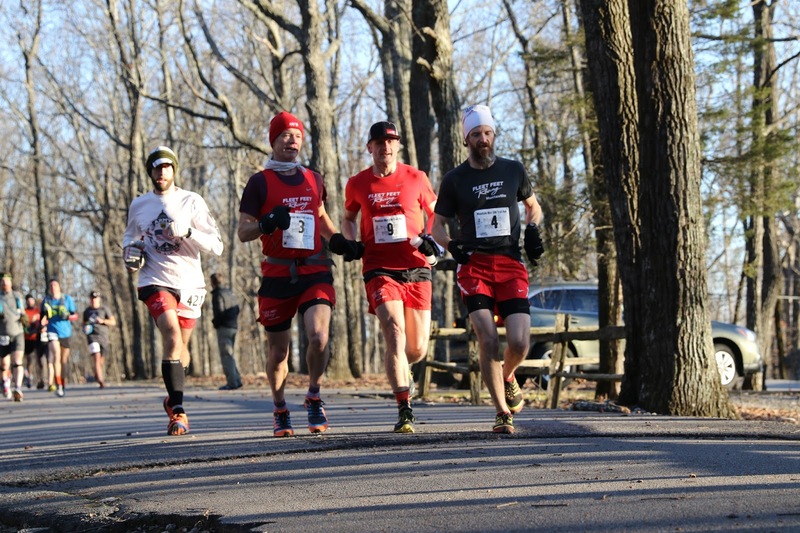 Our small pack was led by DeWayne Satterfield and Brett Wilks, followed by Will Barnwell, Greg Reynolds and myself. No one does a better job pacing the first half of Mountain Mist than DeWayne. Hopefully, he won't kill me for sharing this little tidbit with the world. Then again, after 22 finishes he better know how to run this race, am I right? Trying to hang on to DeWayne Satterfield for the first few miles. The field of runners spread out pretty soon after the start and by the time we reached mile 3 and headed down North Plateau and Cold Springs trail, I was settling in nicely, still following DeWayne, Brett and Will. I believe Greg had passed us earlier and was now running ahead of us. By the time we crossed Old Bankhead and entered Mountain Mist trail, DeWayne and Brett had pulled ahead as well. 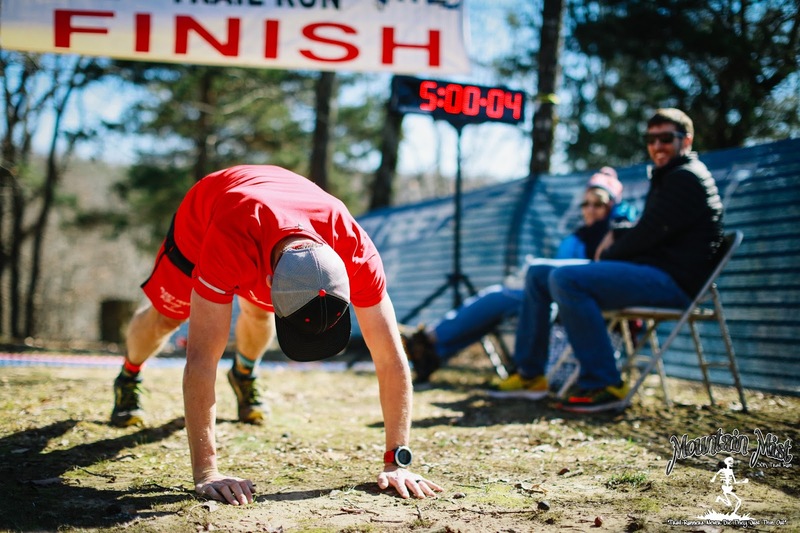 Will and I continued to run together, talking about upcoming races and our training leading up to this one. Soon after, the eventual overall female winner Jackie Merritt caught up to us. We all ran together for a while and swapping positions back and forth as we crashed down Warpath Ridge and onto the Powerline Cuts section. At this time, I still had not looked at my watch one time. We exited the powerline cuts and soon after, K2 was upon us, the first real climb of the race. By now, Jackie was running ahead of Will and I and as she started to power-hike the climb, Will and I gladly obliged. Running with eventual female overall winner Jackie Merritt in the early stages. By the time we reached the top of K2 and turned onto Goat Trail, Jackie was ready to pick up the pace while Will and I preferred to take a little breather by easing into a faster pace. Jackie continued to pull away until she was out of sight and I was just fine with that. I figured she had bigger goals for the day. Will and I continued to run together until we entered the Three Benches AS. We both quickly refilled our bottles and went on our way and on to Keith trail. Shortly after, Will also decided to pick up the pace, noticed by me due to my heavier breathing as I was trying to keep up with him. Not a minute later, he was out of shouting reach and I was on my own. For the third time, I was able to show restraint and not try to keep up with another runner. Again, I did not check my watch to see if I was slowing. 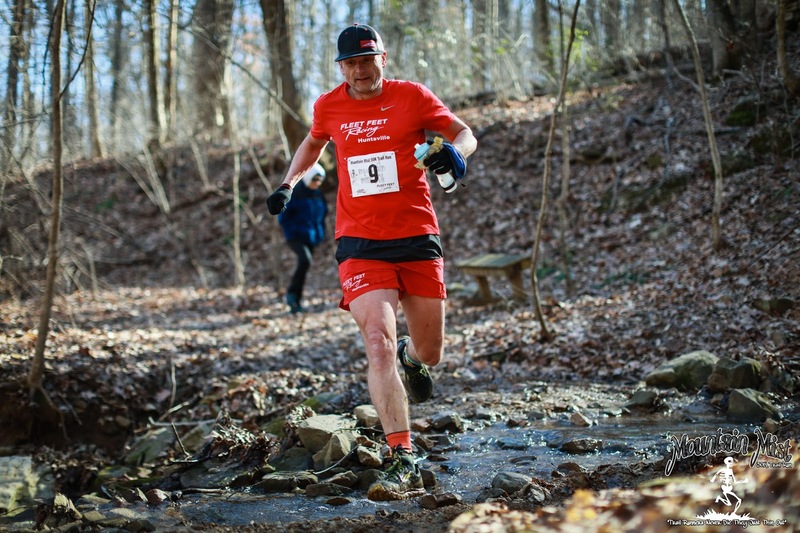 Entering the Stone Cuts, one of the most memorable sections on the course. 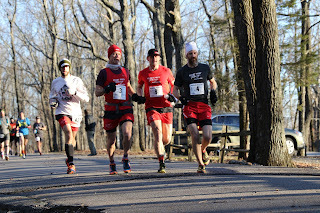 I entered the Stone Cuts running solo and staying solo pretty much for the next few miles, all the way down Sinks Trail and on to the Red Gate AS, the unofficial halfway point at mile 17. 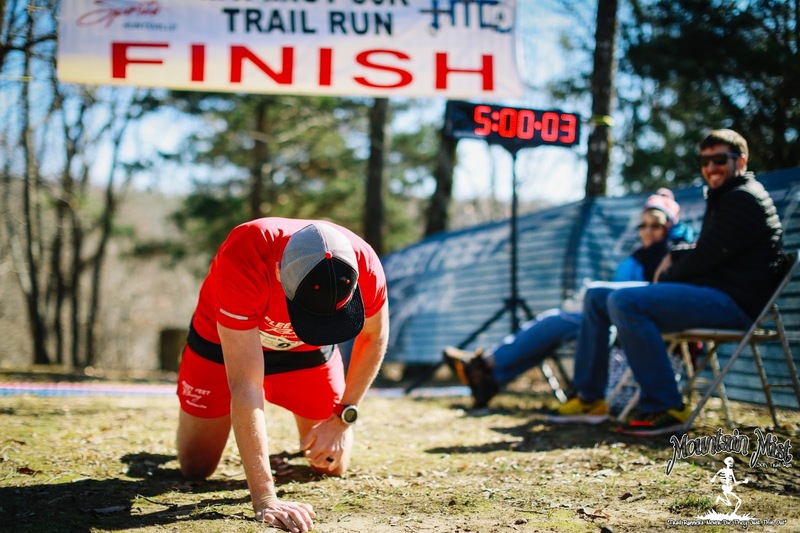 It is referred to as the halfway point, because most runners are generally able to double their split time from the red gate to calculate their finish time. Even though the second "half" is only 14 miles, it contains the two most difficult and sustained climbs of the race, generally causing runners to slow significantly and to essentially run the final 14 miles in nearly the same time as the first 17. If you've run this race, check your splits, I bet it's pretty close to this tried and true formula:-) I arrived at red gate in 2 hours 28 minutes. This was the first time I had looked at my watch. According to my split time, I was still on track to break 5 hours and I had not even once checked to see my pace, essentially running by feel for the entire 17 miles so far. The plan was to continue with this method and to stay comfortable. I was feeling extremely well, almost too well, but in ultra running you to wonder why you are feeling well, you just ride that wave as long as you can because you know, it will not last long. 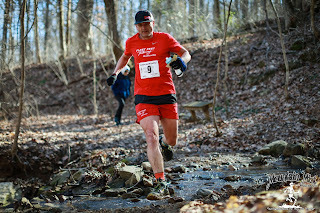 Skipping across the creek just before Red Gate AS, the unofficial halfway point. Because I had lost all of my Salt supplements (Base Salt) as I was trying to get some of it right before entering the Stone Cuts section, I had to down a small cup of table salt to try to avoid the otherwise inevitable muscle cramping. I refilled my bottle, thanked the volunteers and friends cheering and went on to Tollgate Trail or the "runway" as I refer to it now, since the severe storms required utility trucks to use the trails to access some powerlines for repairs just a month earlier. 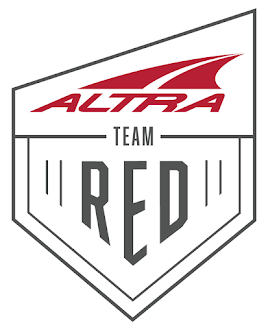 In fact, were it not for the tireless efforts of our local SORBA mountain biking club and HTC volunteers, the race would have had to be rerouted or even cancelled for the first time to avoid the severely damaged North Plateau, Cold Springs and Railroad Bed trails. Over 100 volunteers showed up to clear trees (too many to count) and fill in the numerous holes left by massive uprooted trees. Many of those repairs (as well as the damage requiring the repairs) was clearly visible between miles 2 and 4. Railroad Bed Trail just before Alms House Trail or as I call it, Waterline approach trail. I had taken a pretty bad fall earlier in the day when descending Sinks Trail after leaving the Stone Cuts, landing on my forehead and nose, leaving me with a bump on said forehead but no other immediately visible injuries (more on that later). 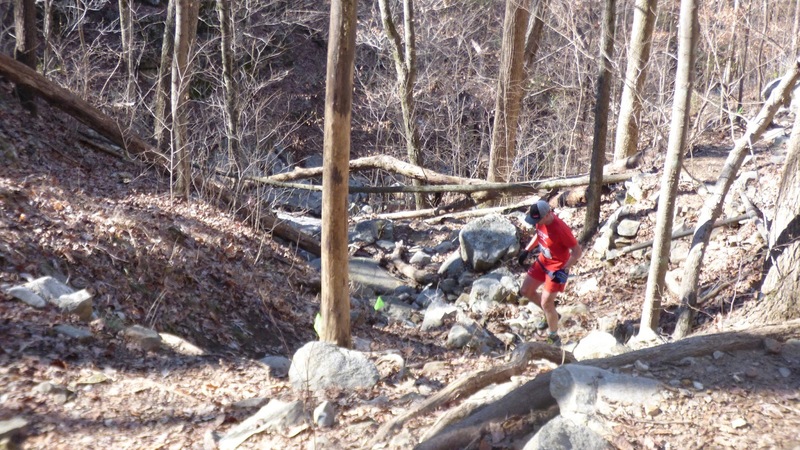 As a result, I had become rather timid on the more technical descents on the remainder of the race course. While I was able to run Tollgate and even High Trail pretty steadily, I had to slow down more than I wanted after turning onto Bluffline Trail. Still I managed to trip twice only barely avoiding another painful fall. I would continue to kick rocks and hug the occasional briar bushes all the way to the end of the race. I made it to the Land Trust AS without any major injuries. Once again I refilled my bottle, but this time I also grabbed and downed an energy gel. I had been taking a gel about every 50-60 minutes, but I did not eat any other food aside from those gels. 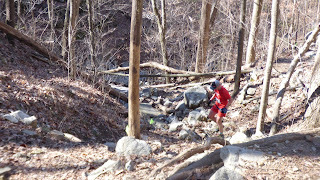 The next sections, Railroad Bed and Alms House trails are no less technical. In fact, they seem to form a near endless rock garden until you turn left to begin the infamous 0.7 mile Waterline Trail climb. This was the only climb of the day that I ran more or less in its entirely. Still, I was own my own. 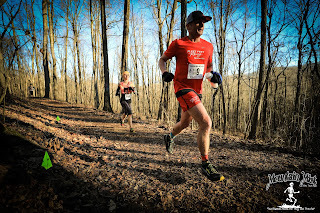 Even with as many as 400 runners on course, I had been running solo for over an hour now, passing only two runners that has slowed due to either bad falls or due to ankle rolls (Sorry again, Matthew Hammersmith and Vince Molosky, my UTMB brother, for your misfortune). It seemed lots and lots of folks had falls and ankle rolls this year, not sure why. Maybe the near optimal conditions caused folks to let their guards down too easily? Who knows. Making my way up Waterline Trail above the waterfall. Once again, but only for the second time today, I took a glance at my watch just before starting the climb. I had to keep moving if I wanted to keep a small chance of breaking 5. I had lost some time on this last section. I did my best ultra shuffle up Waterline in an effort to keep my heart rate under control and at the same time move faster than just to power-hike. 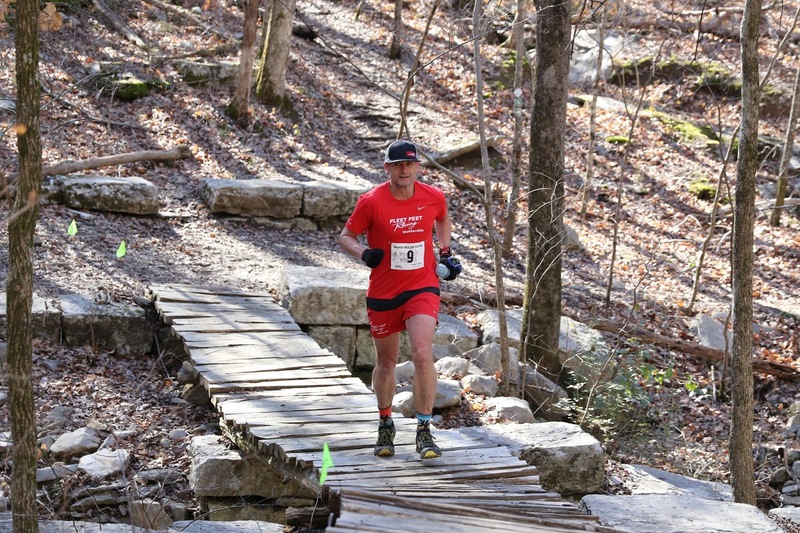 I arrived at the Through Springs AS exactly 3 hours 50 minutes into the race. I left the aid station with 69 minutes to cover the final 10K that contained the toughest descend yet along with another 0.7 mile climb to Rest Shelter. This would be extremely close. I would have to wait until I got to the top of Rest Shelter to reassess whether there was a realistic chance to still meet my goal. The final 10K was tough. 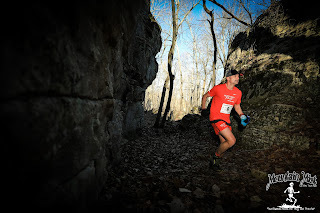 I ran Arrowhead Trail and continued the descent down Natural Well, passing a couple of runners, one of which (Daniel Sillivant) would later pass me again on the final 1.7 mile flat section to the finish. This is also were I was passed for the first time since being passed by the eventual female winner around mile 10. Alex Clark was on fire, taking names as he blazed down Natural Well and onto McKay Hollow Trail. I was trailing in his dust as I tried to keep him in sight while trying to avoid the deeper mud sections on McKay Hollow Trail. All in all, this section wasn't quite as bad and muddy as I had expected. As I approached the final climb for the day, Rest Shelter, I could see Alex about two switchbacks above me. He started to taunt, I mean coax me along while running ahead of me and looking back o er his shoulder, trying to keep me moving and even though I was pretty damn tired at this point, it did work. I was just too proud to just let him take off without me at least making an effort to stay somewhat close. I knew he had way more left in the tank than I did, but this was not about me thinking or hoping to catch Alex, this was about me not having entirely given up on that sub 5 hour goal, even though the chance had turned from slim to nearly none. I arrived at the top of the final climb at the Rest Shelter AS at 4 hours and 45 minutes. I had told Josh Kennedy, the Rest Shelter AS captain and volunteer extraordinaire, that I would sit down for a beer and some chilly, IF I had no chance of running sub 5. But if I had a chance, I would just chug some Coke and be on my way and Josh had promised to give me a good kick in the @$$ to ensure I had some momentum as I was leaving. Looking at the clock, it did indeed appear that the time window had closed, but I wasn't quite ready to give up just yet. I chugged three small cups of coke and when the clock showed 4:46, I took off. I had to run a 1.7 miles at about 9 min per mile pace, but at this point it may well have been 5 minute miles as I was nearly 30 miles into the race with my tank running on empty. As Daniel finally caught up to me and passed me with about a mile to go, he too insisted that I could still break 5. "You crazy" I thought. And as I thought that, I clipped another rock that sent me into a nice patch of briars that proceeded to leave little love marks all over my thighs. "F@#$!!!" I yelled in pain and disgust, quickly looking around to apologize to anyone who may have been around to hear me. Thankfully, I was on my own. I continued on, flying at sub 6 minute pace (well, it felt like it but was actually 9 minute pace). As I started to hear the crowd at the finish line, I went into an all out sprint, I knew it would be close. I finally crossed the finish line after nearly missing the final sharp turn 20 yards earlier (don't ask, ultra brain) with 5 seconds to spare. I immediately fell to the ground in exhaustion, only to be attacked by the worst cramps ever. ...and attempting to fight it with my pathetic version of a "downward dog". Thanks again to Dink, Suzanne and all the other amazing volunteers that make this event truly special. I spent the entire afternoon hanging out at the finish line and inside the lodge, chatting with old and new friends and swapping out our running stories from today and years past. I was pumped to be able to catch up with so many of my friends and cannot wait to do it again net year...and the year after that...and after that. As Dink always says and I'm paraphrasing here, "this is Mountain Mist and the weather is always different than the forecast". Well, this year, the Mist surprised us again by actually turning out even better than predicted in regards to the weather. I guess we all know what that means for next year's Mist, snow and sleet, yippee!! !